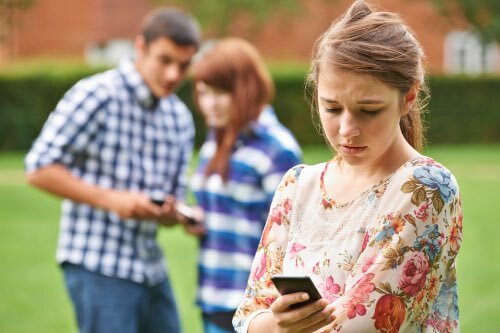 Though Emma’s case is typical, cyberbullying takes on many forms: hacking victims email and social media accounts to set them up; encouraging nasty public gossip and publicly sharing harmful content; creating hate social media pages and/or websites; sharing sexual images or videos without a person’s consent; and malicious anonymous posting. There have been various teen suicides strongly linked with cyberbullying. 17 year old Daniel Perry5, 15 year old Amanda Todd6 and 13 year old Megan Meier7 were all tragic victims of cyberbullying. What makes cyberbullying worse than regular bullying? media and gossip – and smartphones are used to arrange pickup times with parents. Moreover, even if a child closed all of their social media accounts to escape the bullies, their peers would still inform them of the latest publicly shared comments and images. This social reach of social media also forces a spotlight on the victim. In Megan Meier’s case, it was not only “Josh” who was calling her “fat” it was everyone else on her MySpace page. Even those who did not join in could still see the conversations. This makes the victim feel incredibly exposed, as though everyone is looking at them. The final problem is that cyberbullies use a child’s shame against them.For instance, teenager Amanda Todd flashed herself to an adult male on the internet. When the man asked her again to put on a sexual show for him Amanda said no. The man sent her picture to everyone that she knew and later made an entire Facebook group about her with the image of her breasts as its profile picture. Despite moving towns and changing schools several times, the bullies followed her via the internet. Eventually, Amanda killed herself.9 Similarly, 17 year old Daniel Perry committed suicide after being told to “deposit thousands of pounds in to an account or images or video of him would be shared with his family and friends or the public.”10 Shame is a powerful tool which bullies can use to both torment and blackmail their victims, preventing them from seeking help. How do we deal with cyberbullying? Create secure passwords and do not leave online accounts permanently logged in. This will help stop the bullies from accessing their social media and email accounts. Change privacy settings on social media sites. Increasing their privacy settings will limit the number of people who can view and interact with their content. Encourage sensible sharing and the use of privacy software. Children need to understand about the repercussions of sending inappropriate messages and images. They also need to know the importance of safeguarding their online identity and privacy, and how to use good quality privacy software to protect themselves. Block the bullies. Bullies can be easily blocked on social media sites like Facebook. Emails can also be blocked. Phone numbers can be blocked by contacting the telephone provider. Report the bullying to the website. All of the big social media sites have a “report” function. With any luck, the bully will have their account closed and any humiliating groups or pages made will be taken down. Individual comments and images can also be reported and removed. Facebook is now taking steps to crack down on the bullies and ensures that all reports of bullying are anonymous so the bully won’t know who reported them. Not only does Facebook also have a helpful guide that explains how children can report bullies, they also have an entire section about how to deal with bullying on Facebook. Don’t respond. Log out. The best method for dealing with cyberbullies is to simply stop talking to them. Without a reaction, most so-called trolls and bullies will stop. Collect the evidence. Take screenshots and print-outs of the comments. This will be vital if you need to talk to the school or even the police about the matter. Support your child and encourage them to speak to a trusted adult. Many children do not feel comfortable disclosing information about their online world with their parents. Rebecca Todd and Daniel Reid’s bullies deliberately used their shame against them to prevent them from seeking help. Speaking to a family friend or a teacher could be a good alternative.